Debbie Africa, smiles next to Alia Africa, (granddaughter) and Mike Africa, son, during her first public appearance at the Faith Immanuel Lutheran Church, in East Lansdowne, Pennsylvania. Tuesday, June 19, 2018. The first MOVE member was granted parole, after 38 years in prison. It was a strange sendoff for Debbie Africa, as Janine and Janet Africa helped her pack, talked about the future, and quietly tried to make sense of their diverging fates. On Saturday, Debbie Africa left the State Correctional Institution Cambridge Springs and, after 38 years, became the first of the MOVE Nine to be released on parole. She also said goodbye to two women she's been incarcerated with for four decades. Both were denied parole last week, for reasons Debbie Africa can't understand. 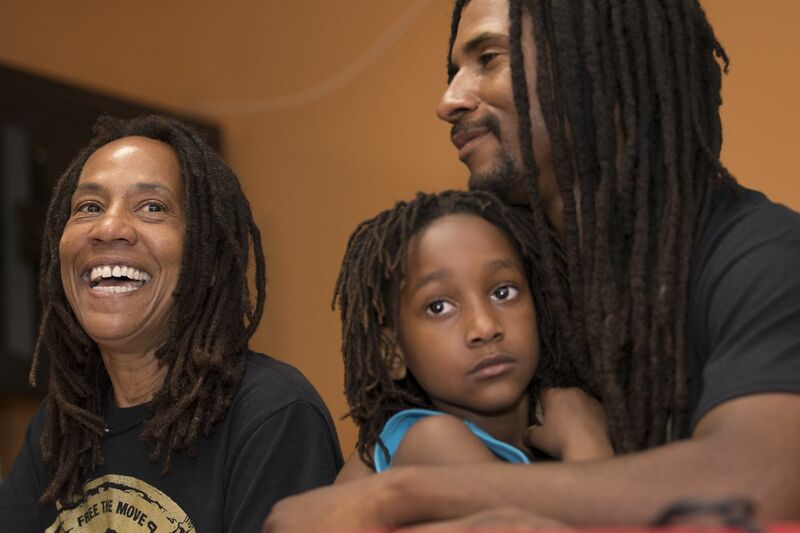 "Although I felt excited and overwhelmed and happy," Debbie Africa said, "I still felt incomplete, because I left prison and my sisters Janine and Janet didn't. We came in on the same charges. We had the same everything. But when it came time to get out of prison, they didn't do that the same. It's a bittersweet victory for me." With an electronic monitor around her ankle and her son, Michael Jr., born while she was at the House of Correction, at her side, Africa, 62, made her first public appearance Tuesday at a news conference in the basement of the Faith Immanuel Lutheran Church in East Lansdowne. Along with eight other members of MOVE, often described as a radical back-to-nature group, she was convicted of murder and sentenced to 30 to 100 years in prison after a 1978 standoff at its Powelton Village compound, where Philadelphia Police Officer James J. Ramp was killed and 18 police officers and firefighters were injured. At the trial and since, MOVE members have maintained that they did not fire any shots. None of the three women were found to have possessed weapons. Debbie Africa as seen on the cover of the Daily News in 1978. That incident came seven years before the infamous bombing of the MOVE compound on Osage Avenue that left 11 dead. Debbie Africa heard about that event in her prison cell. "None of us believed it," she said. "When the officers came to tell us, we actually said, 'Get away from our door, because it's not true.' It was devastating." But nothing, she said, was worse than giving up her son just three days after he was born. She also has a daughter, Michelle, who was just 2 years old at the time. "That was the hardest thing I've ever had to do — and then feeling that emptiness," she said. She said her constant belief in MOVE's values had kept her strong. Michael Jr. was raised by MOVE members, and continues to believe in what he describes as a prescient environmental ideology. His father, Michael Africa, is incarcerated at Graterford Prison, and will be considered for parole in September. Michael Jr. said having his mother stay with him in his home outside Philadelphia has started to make him realize just how much he missed. "I saw her feet. I noticed this was the first time I ever seen her feet before," he said. "A friend of mine said to me, 'You are learning at almost 40 what babies learn about their parents.'" Delbert Africa, arrested in 1978, has been denied parole since 2008. Debbie Africa, now a grandmother of nine, said she had sought parole nine times since 2008. This time, she had help from a group of legal advocates including Brad Thomson, a Chicago-based lawyer with the People's Law Office. He submitted thick packets for each woman with dozens of letters of recommendation, certificates of achievement, "exemplary" conduct reports and other supporting materials, including a review of their records by Martin Horn, a former Pennsylvania corrections secretary. Janine Africa reported her child had been killed in a police action in 1976, though that report has been disputed. The parole board's decision to release Debbie Africa, whose legal name is Debbie Sims, cited her positive adjustment and a recommendation from the District Attorney's Office. The decisions for Janet (Holloway) and Janine (Phillips), however, cite negative recommendations from the prosecutor. A spokesperson for District Attorney Larry Krasner said Krasner had provided positive recommendations for all three women. A representative for the parole board declined to provide clarification, noting that communications to the parole board are confidential. Two members of the group have died in prison. The others, ages 58 to 72, remain eligible for parole. "They all have similar stories in terms of being mentors, deescalating conflict within the prison," Thomson said. Robert Holbrook, a juvenile lifer who was released four months ago, worked on the case as a paralegal with the Abolitionist Law Center. He's hoping Debbie's husband, Michael Africa Sr., will be the next to come home. "He was a mentor to a lot of us young guys coming through," he said. "He would help us navigate prison culture and maintain a positive outlook, as we unfortunately grew up in prison." The couple have communicated only in letters for 40 years. Michael Jr. said he hopes the peaceful life his family longed for will be possible at last. "We're on the path now to make our family whole."